In our warm and positive environment, you’ll immediately feel the joy and happiness of the Indy Sports & Family Chiropractic team. We’re always smiling and ready to give you the support you need. All ages are welcome at our office, and you’ll often see kids here. Though lively and upbeat, the practice also features private, quiet rooms where you can receive the focused attention you need. If you download your paperwork from our website and bring it in completed, this appointment will take about 45 minutes. Otherwise, please plan on arriving early to fill out forms. We’ll begin with a quick screening of your nervous system function with a noninvasive spinal scan. Then, you’ll go to a private room to meet with Dr. Karen to discuss your health history. A postural evaluation will be next, followed by an examination of your nervous system and all joints of the body. We’ll complete orthopedic testing and take X-rays if necessary. Then, we’ll give you a chiropractic adjustment and any therapies that are prescribed as part of your personalized plan. You and Dr. Karen can decide how to proceed in the future, allowing you to choose if you’d like to relieve your pain or take your healing further to correct the underlying problem. This visit takes about 30 minutes. Subsequent appointments will be shorter. You’ll sign in electronically when you arrive, have any necessary therapies and get your chiropractic adjustment, taking 10-15 minutes in total. 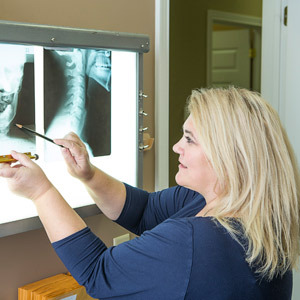 We believe that maintenance care can prevent degeneration of the spine. Our ultimate goal is to correct the source of your problem and stabilize your health, then get you on a plan of maintenance care as soon as possible. These periodic visits ensure that you stay healthy and enjoy the highest quality of life possible. Insurance is accepted at our office, and we are preferred providers for many insurance plans. Schedule your time with us today!